Level 3 Personal Training course delivered through blended learning. This is an advanced course to become a personal trainer. To be eligible for this course you must have completed the Level 2 Gym Instructor Certificate. With our Level 3 PT course you will be able to qualify as personal trainer in as little as 3 Months (providing you already hold the Level 2 Gym foundation qualification) . Our course is accredited by REPS – the Register of Exercise Professionals and is worth 20 Reps Points. The course requires you to have completed the Level 2 Gym foundation qualification. 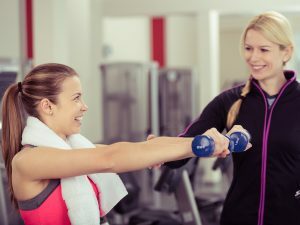 If you have not yet completed the Level 2 Gym Instructor Course – but want to become a personal trainer, you may be interested in our Combined Level 2 and 3 course. You can pay for the course in 1 instalment of £795 or in 4 monthly instalments of £198.75 each. Our blended learning approach means you learn the theory elements through our online learning platform and the practical elements during 6 contact days at our YMCA Lincolnshire centre. The Online learning element requires 30 hours preparation, and can be completed at your own pace. If you have any questions while completing the online theory part of the course – our trainers are very happy to answer them over the phone or via email. To gain the Level 3 PT Certificate you will need to pass the practical and theory based assessments – which will take place during the 6 contact days at the YMCA Lincolnshire centre. The course takes as little as 3 months to complete. We recommend you spread the 30 hours of independent online learning over 2 months. The course concludes with 6 scheduled contact days (see dates below) consisting of theoretical and practical workshops, revision sessions and assessment – giving you the support and experience to reach your potential. If you have any queries about the payment options, please be in touch with us on: 01522 888218 or 888203.